Bean Bags R Us NewsKids Bean BagsHow Can Bean Bags Assist with Early Childhood Development? How Can Bean Bags Assist with Early Childhood Development? According to the Australian Bureau of Statistics (ABS), in 2011-2012, more than a million Australian Children under the age of twelve were using a child-care facility in Australia. The majority of parents are using child-care facilities because of their work commitments. These facilities play an essential role in early childhood development. Especially considering the amount of time our children are in them. A study conducted in 2012 in the United Kingdom showed happy children are more likely to become successful and end up in higher paying jobs. Perhaps it is the positivity of children that eventually determines their outcome. Unhappy children are more likely to underachieve and end up on the wrong side of the law. But, you can’t force your child to be happy, it is up to them. Have you ever wondered about the effects of colour on your child’s happiness? Imagine how they would feel if surrounded by black, white and grey. Warmer colours such as pink provide a feeling of comfort. Red, orange or yellow may help to stimulate the mind. Red may increase the performance of a budding athlete. However too much may not be suitable for their academic achievement. Blue lowers blood pressure and provides a calming effect. Green is often associated with well-being as it has a soothing effect on the body and mind. If you want to reduce anxiety and increase concentration, be sure to give your child plenty of exposure to greens. There is also some evidence to show it will enhance their reading ability. One study discovered that overlaying a transparent green sheet over text, improved children’s reading speed and comprehension. Often adults ask children to do things they have not done before, or they may not like doing. These unfamiliar requests may cause discomfort to the child. Just like sitting in an uncomfortable chair. Imagine trying to read a book or engage happily with others if you are not comfortable. Ensuring your child’s comfort will undoubtedly assist their learning and their happiness. What makes a child comfortable when seated for many hours each day is a chair that provides equal support to those areas of the body that are in contact with it. A relaxed seating position will ensure the child is not using muscles unnecessarily to support parts of the body that are not gaining adequate support from the chair itself. Being seated at a desk or table for up to eight hours a day is unlikely to have positive effects on the posture of a young child. That’s why bean bag chairs for kids are the perfect choice for child-minding centres and will aid in early childhood development. 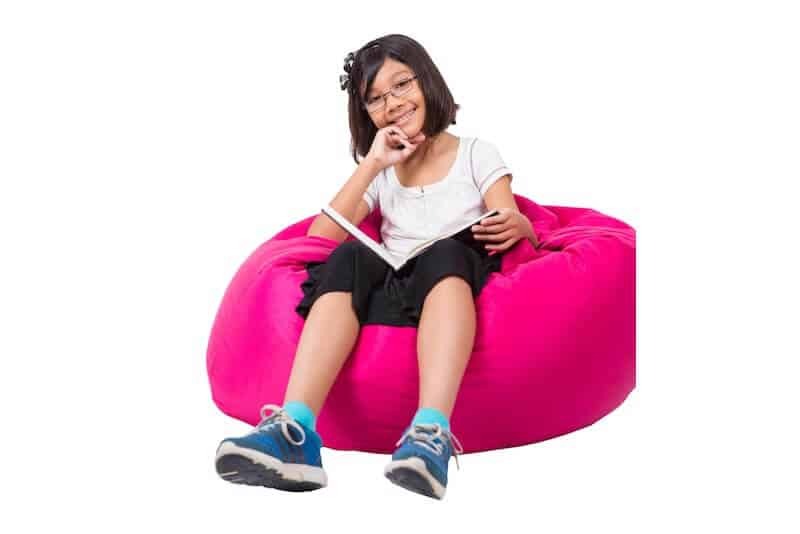 As many centres use outdoor areas for their children, outdoor bean bags may be advantageous. Many outdoor bean bags are also suitable for indoor use. Dr Shinichi Suzuki founder of the Suzuki Method discovered that children learn from a very early age. Just as they learn to speak, crawl and walk, they can learn musical instruments from a very early age. It’s important that children relate learning to happiness and that they enjoy their early years of learning. If a child is not happy at home or school, it is unlikely they will enjoy learning much at all. This mother-tongue approach has successfully been applied to other fields such as art, poetry and mathematics. To ensure your child develops a healthy body and mind, consider using kids bean bag chairs in their bedroom or play area. Bright, happy colours and overall body support will enhance their happiness from an early age. We’ve had feedback from customers whose children were virtually out of control, that our bean bags have assisted them in being more relaxed and attentive. If your child suffers attention deficit disorder or has some learning difficulty, it may be a lack of happiness or some discomfort that is contributing to this. Do you spend as much time and effort ensuring your child is relaxed and comfortable when seated, or do you expect them to sit at the dining table while they do their homework? If it’s not ‘cool’, chances are your kids won’t like it!